1)Different kinds of reamer are applied to different construction environments. Barrel back reamers are applied to clay layers; Flutedback reamers are applied to for sandy and gravel environments; Cutting back reamers are applied to rocky soilor rock. 2) Welded cutting bits use special alloy column to enhance impact and abrasion resistance and improve the reamers' lifespan. 3) Our reamers range from 7.87 in to 59.06 in. 4) Reamers may be connected with octagonal sleeves, pin and box pull heads, drill pipes, andswivels. 5) We also produce the reamer withswivel. 6) Reamers may be customized according to customers' requests. We can produce barrel reamers accroding to customer's special requirments with low price. Our products are firm and durable. 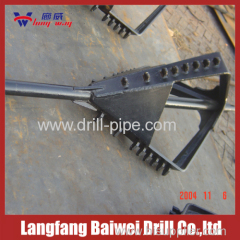 Langfang Baiwei Drill Co., Ltd, the predecessor is Langfang Baiwei Drill factory, was established in October 2003, in April 2006 purchased the land to build new plants in Hebei Yongqing Industry Area. Meanwhile register and set up a Langfang Baiwei Drill Co., Ltd. In December 2006 completed movement and put into production.